Thought it was time to feature another handbag for this month's 30 wears post. 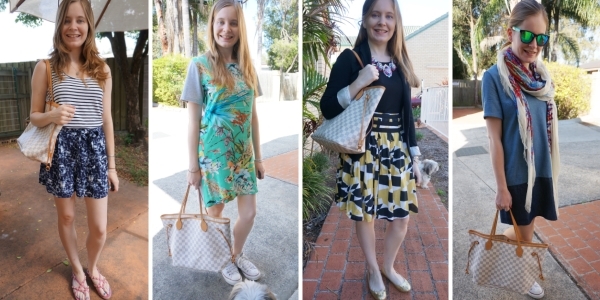 Every month, I take advantage of having a daily record of my outfits as I look through the blog and find something I've worn 30 times or more, and share it with you as part of the 30 wears challenge. I started it in 2017, and it's a lot of fun! I got this neverfull bag all the way back in 2011, so it's 7 years old this year. 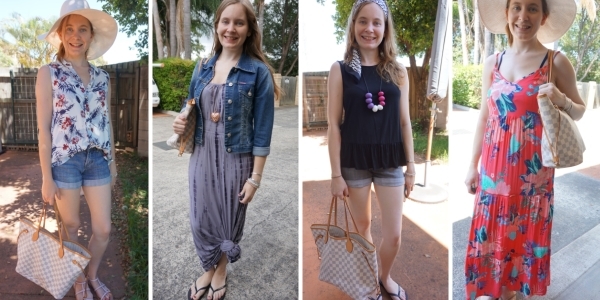 When I looked through the blog I realised I'd worn it a lot more than 30 times. Given all the times it's been worn on the blog, and having it a year before I started blogging, it's easy to assume it's had over 100 wears. In keeping with the theme though, I've picked just 30 of my favourite outfits to share here. In terms of cost per wear, this is still high. I did have a vintage speedy bag that was 20 years old and still going, so I expect this 7-year-old-bag to also be around and be used in another 13 years. That's the thing with investing in bags, you expect to have a lot of years of use to recoup the cost you spent. It was $875 at the time, so around 100 wears is $8.75 a wear. Retail of this bag now from Louis Vuitton is more than double, at $1,810 AUD! That's after 7 years worth of price rises, so I'm not to concerned at my high cost per wear, it could be worse! To be fair, the new bag comes with a little pouch too, so it's not just needless price increases. Still a big difference in price though. While I love tiny little cross body bags and clutches like the Rebecca Minkoff mini MAC with my maxi dresses, a big holdall tote like the neverfull looks great too. 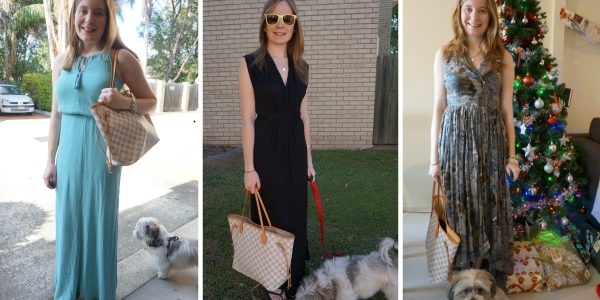 It's such effortless style, picking a big tote bag and a classic maxi dress. It's not just maxi dresses a neverfull looks great with! You can easily pair the bag with casual outfits, and I often wear mine with jeans. 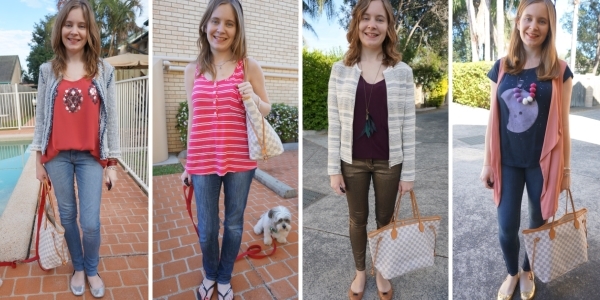 Skinny jeans are my go-to choice, but any pair of jeans works well with a tote bag, even those metallic ones in the third picture. While a neverfull looks great on weekends with a maxi dress or jeans, it also functions perfectly as a big tote for the office. On days where I have multiple meetings to attend or I'm away from my desk for an extended length of time, I like to take the neverfull bag as it has room for any files or notebooks I need, as well as a bottle of water and a cardigan if necessary. 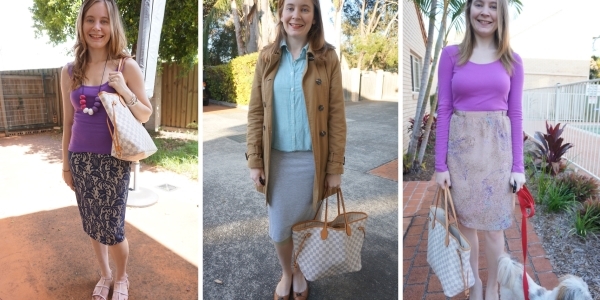 Just like the dresses above, a neverfull works great with pencil skirts to the office too. I have the damier azur neverfull with the blue checkerboard print, so as you can see from these photos I like pairing it with purple! Blue and purple is one of my frequently worn colour combinations. Of course it's not just a workplace you can wear your neverfull! Being such an easy to care for tote it's a good bag to take to the beach, as you can just wipe away the sand. The body is coated canvas so wipes clean easily with a baby-wipe! 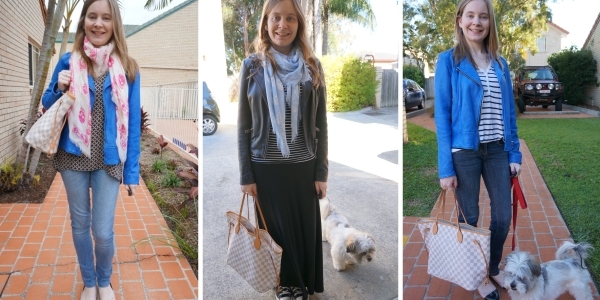 You can see the versatility of the bag in these four photos too, as it works with the denim shorts or maxi dresses, all good outfits for a day at the beach. While the spring-like white and blue damier azur print looks perfect in a beach setting, I don't reserve the bag for exclusive spring or summer wear. It's a nice bag to wear in winter too, to add a little lightness to your outfit. The damier azur neverfull has leather handles and trim so I would keep it dry and wouldn't take it out on a snowy or rainy winter day, but it does look just as good in the cold as in the heat. Definitely a year-round bag. 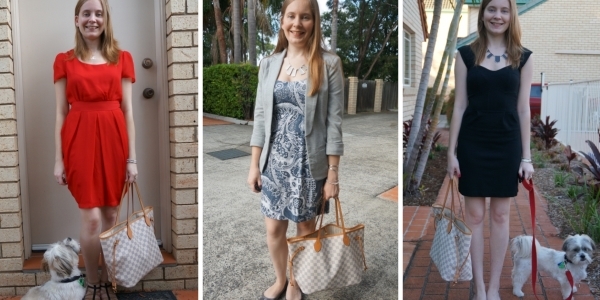 The monogram and damier print neverfull bags are easier to wear than you think! I don't have any problems pairing the printed bag with an outfit that has a print in it. Of course, stripes are my staple for pattern mixing so they are a good option to start out with if you're unsure about what prints to wear with the damier print bag. It's not just stripes you can wear the printed neverfull with! I really do see the classic damier azur print as a neutral, and I'll wear it with bold prints like florals, or even in an outfit I'm already print mixing with as a third print. You can easily wear this with printed dresses, skirts or scarves. You need to carry quite a lot in pregnancy! Whether it's the bottle of water you constantly sip from, various crackers, ginger tablets or lollies that help you overcome morning sickness, or snacks for the second trimester munchies, you need a big bag! 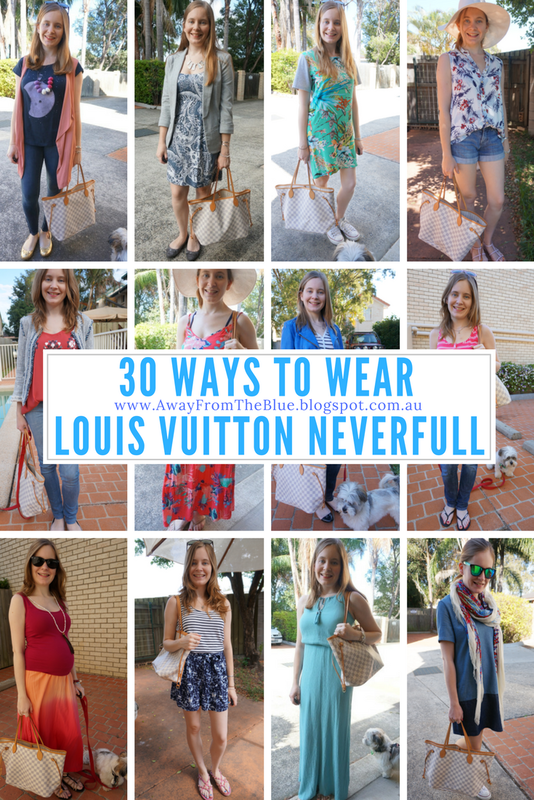 The Louis Vuitton Neverfull is perfect for that, and being a canvas bag it is light enough to wear that it doesn't add to any of the pregnancy aches and pains. This set of photos proves why I invest in accessories too - they consistently work for you, no matter how many pregnancies you have or how big your belly gets. A definite must-have! See the 79+ ways I've worn this damier azur MM neverfull bag, or check out more of the 30 wears series. Linking up with Fab Favourites, Lizzie In Lace, Sharing a Journey, Shoe & Tell, Mix It Monday, On Mondays We Link Up, Hello Monday, On Trend, Confident Twosday. Wow, it shows that the bag is very versatile! Great styling!! I love seeing you style thing bag numerous time. Although the bag is pricey (I can't believe how much the price went up! ), it shows that it was worth the investment. A good luxury bag can go with any outfit! P.S. I love that red dress you wore! Definitely an investment, and it is crazy seeing how different the price is now! Always a clever post! Neverfull is one of the must have bags and never goes out of style. Nice to see how many times you've used it, I'm sure it's worth the money you've paid. I wish I can lower the cost per wear of my bags too haha. Been to the Royal Botanic garden today and it was an awesome day as it's a bit warm, I'm not ready for full-on Autumn yet. Wishing you a fun weekend with the boys. I agree, it's a real classic style of bag! You sure have gotten your use out of this bag. Back in the day I want a LV bag but after seeing the cost. I went with 2 couch pursuing instead. Which both bags have done me great. Plus there pockets inside the bags. This price would be completely incomprehensible here in Portugal only for the very rich. The way I liked it most was with jeans. It is not even sold in the smallest cities of the country just in the capital Lisbon and OPorto. Life here is expensive and we earn very little. There are many Portuguese who are going to live in Australia. I have some old neighbors in Sidney. You always have many ideas to show us. I hope you have a great weekend. Yes, Louis Vuitton bags are definitely a luxury! I'm so lucky to have this one :) I hope your neighbours love it here, it's such a nice country! The Neverfull is such a classic bag, and I love how it goes with everything! Definitely a good investment! This challenge is really such a fantastic way to showcase the versatility of this bag. Even though it was pricey, you're definitely getting your money's worth. Happy weekend Mica! Yes, I'm really enjoying the challenge! Sometimes I feel like if I had a time machine I'd use it for the most frivolous things, like going back to buy designer bags before inflation. I mean, pristine vintage designer bags for what would seem like nothing... But at least your investment in this bag has served you well and maybe someday you'll have a granddaughter to pass it on to (another weird thing I think about, investing in designer bags so non existent grand kids could have them). This is a beautiful designer bag and I am impressed that you have worn over 100 times. It does make sense though as it is such a versatile bag. 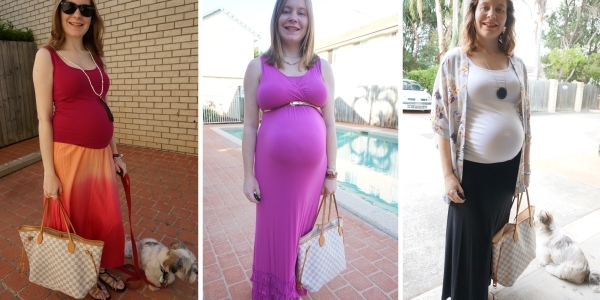 My favorite styles are with the tie-dye skirt when you are pregnant, with the red dress, and with the shorts and printed top. But every look is exceptional. I hope you have a wonderful weekend and enjoy some family time . It really is a versatile bag! I had a wonderful weekend thank you, I hope you did also. What a versatile bag! I tend not to go for bags with prints or patterns but I'm really loving this one! It is a really versatile print! It's great to get a fab cost per wear on an expensive bag. I remember I went to see the Neverfull in Damier and the price was about 800 - now it's over a thousand. Like you mention, its amazing how the price has risen in a few years. It is crazy how high the prices rise! What a great bag and clearly it goes with everything! While a bag like that is way beyond my budget, it's good to think about how a splurge like that ends up really being worth it--I've been using the leather tote that was a splurge for me for years! Wow that is an expensive bag! I have no idea how people have lots of bags and change them with their outfit. I have one bag I use every day and when it gets worn I'll bin it and get a new one, haha. I love your post! This bag is great and it goes with everything :) it is timeless piece and no wonder it looks like new. Have a wonderful weekend and enjoy wearing your beautiful bag. Hi Mica! I am always inspired by your 30 wears! The tote was a great investment! It's so cute and universally flattering. I adore how you styled it! It's such a versatile bag! I love that it easy transitions from a work bag to a pregnancy bag as well. Ugh, I hate luxury good price hikes. It's good that you got it when it was still a decent price! Yes, it was still expensive, but a lot easier to justify than its current price, haha! Over 100 wears and still looks amazing! I have Louis Vuitton Speedy Bag and it also looks great and can be combined with everything! Damier Azur looks great with each and every of your outfits! It's such a versatile bag so no wonder you have so many wears with it! And you take care of it so well! I haven't had a chance to read all your posts or watch the videos but it might be worth talking about how you maintain and keep all your luxury bags in such good shape? So many amazing loooks! As for the bag, I don't think I could ever spend more than $35.00 to $50.00 for a bag, even if I were rich! I'm too frugal! It's so funny as my friend keeps telling me I'd love the Longchamp! I've never taken the plunge yet but maybe I should! Yes, the MM is the perfect size for me! Such a great bag! I don't regret saving up for mine! Girlllll you have surely got your money's worth from this bag. Wow!! In every occasion, you've rocked it. Great outfits here! Have a lovely weekend with your beautiful family. I've said before how good an idea I think 30 ways to wear is! What's great too is that you feel so much better about making any expensive purchase because you KNOW your going to really get a lot of wear out of it! And you've got proof too! Yes, it's great having this challenge to make me think about the value of things I buy! I couldn't use it as a diaper bag! As you can see from the video above! I carry too much, haha! Well this was definitely a wise investment piece - so cute and a bonus now is how much it's valued at now...wow!!! Yes it's a big price increase! One day, I promise myself one day in the future I will own a LV bag. I find it to be such a classic and will last forever. I think they are such classics too, I know I will have this one for a long time! I love seeing your 30 wear challenge! It's nice to know that you don't always have to buy new things to look great! And if I have never said it, I love your bag collection. You have so many great classic bags and your LV tote is no exception. I love how spacious this bag is but more importantly how versatile it is. The print is also gorgeous and one of my favorites because of its subtlety. I hope you had a great weekend and wishing you a marvelous week ahead! Thanks Maureen! I think it's much more fun coming up with outfits from existing pieces than buying new things all the time, for sure! Always so creative. Well done Mica! It's a great neutral that's complimentary to so many outfits. This is such a classic bag. I think I'd wear it with everything you did! This is one of those bags that I've always loved but never thought about buying as I never carry much around with me. You style it perfectly though with every look, Mica! It's been so sunny here this weekend! It was over 28C! That's quite a gorgeous bag! I love its size, super practical, especially for moms like me!